BADGERS GOAL: Grant Besse gets his first goal in 15 games to put UW ahead of Penn State 5-3 in the third. Grant Besse makes it a 5-3 game! He picks up a loose pick and pushes it into the net with 15:58 to go in regulation! Michigan beats Minnesota 5-3, so a Badgers victory tonight would put UW back in a tie for first in @B1GHockey . NITTANY LIONS GOAL: Dylan Richard scores to bring PSU within one, 5-4. Penn State scores to make it 5-4 with 14:48 to play. Per @brian_posick on the radio call, UW defenseman Peter Tischke went to the locker room with athletic trainer Andy Hrodey. 10:29 to go in the third with the Badgers still holding on to their 5-4 lead. In case you're keeping track, all 23 Badgers skaters now have a shot on goal this season. Jake Bunz just got his first in his 6th game. We hope everyone likes icing calls because there's been about 6 or 7 in the past two minutes of game time. UW up 5-4 with 8:18 to go. Badgers call timeout with 5:57 left. UW leads Penn State 5-4. Badgers take a time out with 5:55 to go in the third. UW still hanging on to their one-goal lead. PSU leads SOG 35-28. BADGERS GOAL: Ryan Wagner gives the Badgers a 6-4 lead with 5:06 left on a solo effort cutting through the zone. PSU pulls Jones for an extra attacker with 2:34 left. Penn State pulls their goalie with 2:15 left in the game. BADGERS GOAL: Ryan Wagner scores into an empty net, his second goal of the game, for a 7-4 UW lead over Penn State with 1:46 left. 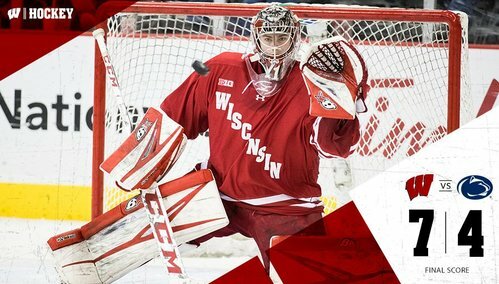 FINAL: Wisconsin beats Penn State 7-4. With 3 games left, #Badgers and Minnesota are tied for first place in @B1GHockey . Looks like the Badgers will move up a spot to 12th in the PairWise, right behind PSU, pending other results tonight. Six different players and UW moved into a first-place tie in the Big Ten. Today was a good day. UW coach Tony Granato said D Peter Tischke told him he'd be ready to play tomorrow. They'll evaluate in AM. I didn't see injury on video. Granato was impressed Matt Ustaski shot instead of passing to Kunin/Frederic on his key goal. "(It) shows how far he's matured." 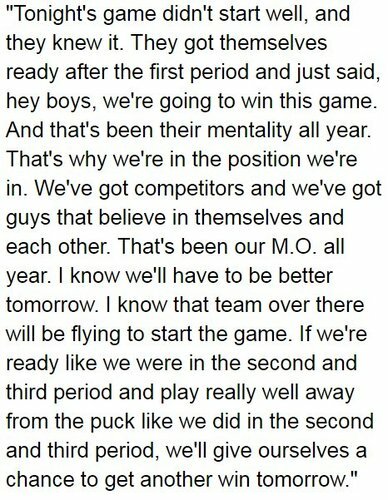 Granato said he thought Ryan Wagner (2g, 1a, +3) and Corbin McGuire (3a, +2) were "outstanding." Will Johnson 1g, 2a, +4.